On occasion, I get asked by students, "How do I get a job in finance?" My answer, which is in the form of a question, is, "What's your motivation?" This is what wrecked our relationship in the end. He was married to his work, not to me. He was working for a big investment firm, running a kind of a hedge fund. I'd tell him, just quit. You have made enough for us to live on for years to come. What's stopping you? We can travel. You are destroying your health, you can't sleep without sleeping pills any more, then in the morning you need more pills to get going. And he'd say, I know you're right, this job is taking over everything, I am losing you. Give me 10 more years and I'll never have to work another day in my life, I'll never have to go back. Sadly, only some of the people who swear an oath to the tour of duty on that very first day fulfill their mission. Everybody reading knows what I’m talking about. To those in the business: how many times have you told yourself, ‘just one more year…just one more bonus’? To those who have friends in the business: how many times have you heard them insist they’ll soon leave their job? Most end up MIA (missing in action). Once behind enemy lines and captured people slowly forget the original plan, easily overshadowed by the perks of the job. I am fortunate that I do love what I do. I would be in this field if it paid little or nothing (and this unpaid blog is an example of my passion). As a young banker in M+A, you have no social life, I mean, none. A work week has seven days. There's no time for friends, and when you have a few hours off, you try to maximise it. Drink really hard, party wild, and you get confronted with drugs – which seems to be a taboo although many do it. You need to feel in those few moments that you're still alive. On Sundays, following one of these binges, I would wake up feeling so rotten, so empty. I used to be the kind of person who enjoys life, who gets up in the morning eager for another day. The past two years I found myself changing. I lost my interest in politics, in sports … I began to wonder: what's happening to me? My flatmate is in finance too. I've seen him coming home crying, from exhaustion, from something that happened to him. Why are we doing this to ourselves? My sense is that the majority of the people in finance have an urge to prove themselves. And banks offer a platform where they can do so. I feel there's a particular kind of insecurity to many bankers, a form of neediness and a deep desire to compensate. Love? In the first year I would work from 9.30 am till 3am, every day. You keep telling yourself, this is going to get better. But it doesn't, not really. Compared with my years in university I have learned so much more in the past two years, so much more. Then again, given my 18-hour work days, these were actually four years. Basically M+A teaches you to truly understand a company; to analyse it the way a doctor would with a human body. You build models of how the company operates, where it might improve in the future, and how. It's genuinely stimulating work. Some people know they want to work in finance from a young age. True, it’s rare but when you meet them in a bank you’ll recognize it. More often than not they’re very sharp. Everyone in the team will either love or hate them. There is no in between. At a junior level (i.e. analyst / associate) they are typically the guys who make far fewer mistakes in presentations and models, digest information and data the quickest and generally appear to feel most at home in the building. It is almost a given that they’ve breezed through their finance studies in university. Some of them probably could have joined a bank straight from school rather than attend university. When these worshippers of finance walk across the trading floor or past the Head of M+A’s office they’ll fight hard to keep a stupid smile from manifesting itself. They cannot help it…the trading floor is like a playground for them…the Head of M+A’s office like a throne. And if receive a nod of acknowledgement from the man inside that office they may rush to the bathroom, lock themselves in a stall and cry out of joy for the job they consider a blessing. They probably hear Vivaldi’s Four Seasons (Spring!) in their heads when they walk around the bank on a busy Monday morning. Or perhaps Beethoven’s Ode to Joy – the part where the entire ensemble comes together in joyous harmony. One of the things I like about the financial sector, it's meritocratic … the boardrooms are often really multicultural. The best moments in this job? There is the game element. Basically, an investment is a hypothesis about the future value of a given company. You believe its share price will go up, and you test your hypothesis by taking a 'position' [buying the share]. Then when you are vindicated, that is really very satisfying. And yes, that means you make more money. In that respect, the money you make expresses the degree to which you have been successful at what you do. Another top moment in this job is when a client decides to trust you with a large sum of money to invest for them. It's a vote of confidence, and that feels great. Yes, it also means that my income goes up, because we get paid partly on the basis of the total amount of money under management. The more you manage, the more you get. But there's the sense of responsibility too, I mean, in the end we represent families, the people who paid into the pension fund whose money we are managing. One of the greatest pitfalls for fund managers is thinking we are more important than the clients whose money we are managing. That's why there are not a lot of Gordon Gekkos among us. Finally, great moments in this job are when your relationship with the company you have invested in has become so strong, and your insights into that company and the market it operates in have become so in-depth, that you end up almost in an advisory role. Obviously management knows its own company best, but you may bring a perspective from the capital markets. Say, we show the company that their current structure is 'suboptimal' as we call that, and we suggest that they sell off part of their operations and accelerate investments in their core business. If such discussions truly lead to value enhancing actions by the company, that is very rewarding. Why finance? I am a nerd. Wasn't always one, but with the years I am becoming nerdier and nerdier. I just love a difficult problem, to tweak and try, until I crack it. I like numbers, too. The work in M&A is really rather interesting, and the better you get at it, the more fun it becomes. I also like to think that this work adds value to society; we help companies sell loss-making divisions, improving their financial health. If you are indeed looking for a job in finance, go and read the Guardian series. Don't go into the business for the money and the prestige. It will ruin your life. Long time readers know that I am a long-term commodity bull. Moreover, I have been writing on the theme of global healing for a few weeks. Despite last week's disappointing US GDP report, I am seeing signs that it may be time to get on the commodity bull for a ride. Both sentiment and momentum indicators are lining up for another upleg in commodity prices. First of all, sentiment measures indicate that commodity prices are at levels suggesting accumulation. 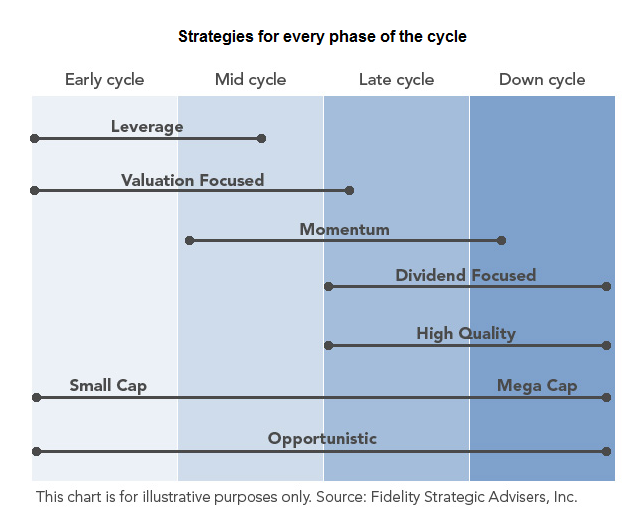 This chart from Mary Ann Bartels of BoA/Merrill Lynch (Note: the depictions of bull and bear phases are mine, not hers) shows that large speculators, who are mainly hedge funds, have moved off a crowded long in commodity prices. The chart was produced by aggregating the Commitment of Data reports for all futures exchange traded commodities in the CRB Index. My depiction of the bull and bear phases show that during the bear phases, neutral readings are good times to fade the rally. On the other hand, neutral readings are good opportunity to accumulate positions during the bull phases. The bull and bear phases is best exemplified by the chart of the bellwether of gold prices, which bottomed in 2002 along with the rest of the commodity complex. Just because there is a neutral signal from this is a good time to accumulate positions doesn't mean that there isn't more downside to commodity prices. 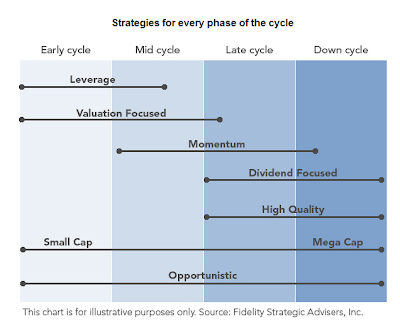 To see some near-term upside, you need a catalyst. Bullish CAT guidance the bullish catalyst? We expect improving world economic growth to increase demand for commodities. 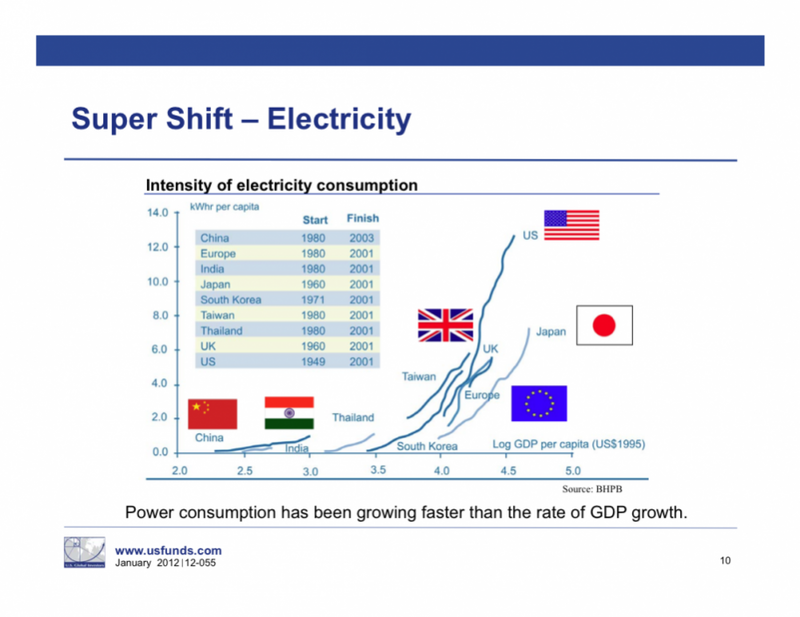 Our outlook assumes most commodity prices will increase slightly in 2012 and continue at levels that encourage investment. We expect that copper will average over $4 per pound, Central Appalachian coal about $75 per ton and West Texas Intermediate crude oil about $100 per barrel. We expect mining to continue to be strong globally, and we have a sizable order backlog for mining equipment. We expect sales to increase in 2012 and are in the process of adding production capacity for many of our mining products. 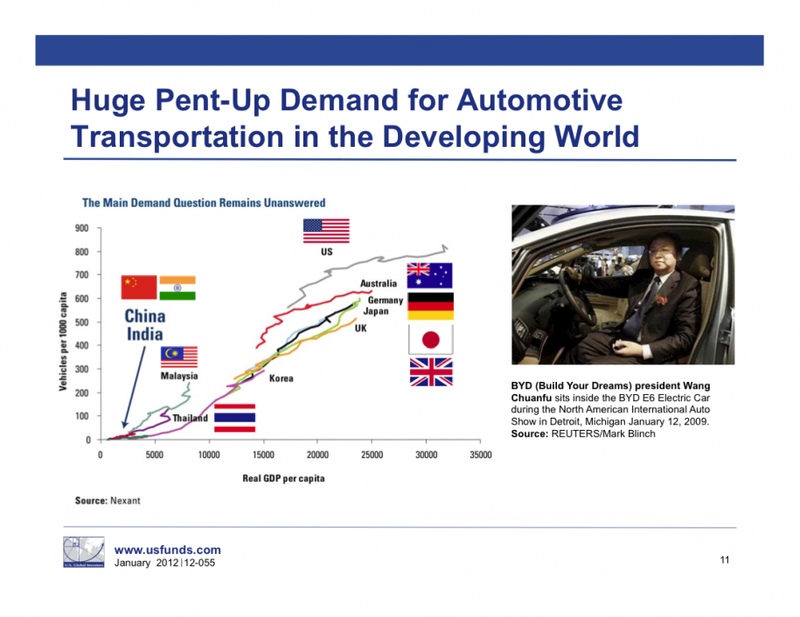 However, we expect sales to be constrained by capacity throughout 2012. We expect total U.S. construction spending, which, net of inflation, has declined since 2004, to finally begin to recover in 2012. We project a 1.5-percent increase in infrastructure-related construction and a 5-percent increase in nonresidential building construction. We are expecting housing starts of at least 700 thousand units in 2012, up from 607 thousand units in 2011. The Eurozone public debt crisis has been a lingering negative, but it is unlikely to trigger a worldwide recession. The Eurozone will likely have at least two quarters of weak, possibly negative growth, but should begin to improve in the second half of 2012. For 2012, our outlook assumes economic growth for the Eurozone near zero and growth of about half of a percentage point for Europe in total. Our expectation for improvement of European growth in the second half of 2012 rests on a continued easing by the European Central Bank (ECB). The ECB has recently lowered interest rates and could cut rates further in 2012. 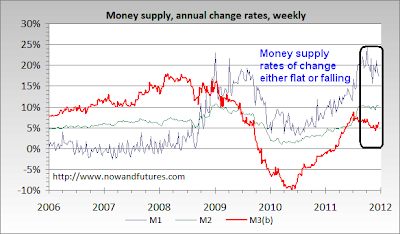 China took its first easing action in late 2011, and we expect that further easing is likely. We expect China's economy will grow 8.5 percent in 2012, sufficient for growth in construction and increased commodity demand. A forward looking bullish outlook from a global company that is highly exposed to cyclical growth. Compounding the criticism of the Fed is the role the central bank has played in the political career of Ron Paul. “Paul’s position hasn’t changed in decades. He’s opposed to the Fed as an institution, preferring a gold standard and free banking,” said Michael Bardo, an economic professor at Rutgers University. Texas Gov. Rick Perry started the attacks off by threatening bodily harm to Federal Reserve Board Chairman Ben Bernanke and accusing him of treason. Front-runner Mitt Romney has since said he would fire Bernanke. Former House Speaker Newt Gingrich also said he would fire Bernanke and went further to propose a commission to examine returning the U.S. to the gold standard. And Texas Rep. Ron Paul has reveled in his unwavering stance of simply ending the Fed. [Mark] Calabria [director of financial regulation studies at the Cato Institute] thinks the Republicans anger might coalesce behind legislation to end the Fed’s twin goals of low inflation and low unemployment in favor of a single low-inflation mandate. Libertarians such as Ron Paul have long been advocates of abolishing the Federal Reserve in favor of the market discipline of a gold standard. Notwithstanding my opposition to the gold standard (see my previous comments here and here), consider what changing the Fed's dual mandate to a single anti-inflation mandate might mean. First of all, you get the ECB, which until Draghi era began, stood aside while Europe burned. In addition, good quants know that optimizing a system to a single objective function without considering other factors can lead to perverse results. For instance, investors generally construct portfolios to maximize their risk-adjusted returns (however that`s measured), which is comparable to the opposing objectives of the dual mandate of the Federal Reserve. What would happen if they were to move to a single mandate by trying to either just maximize expected return or minimize risk? If they were to maximize expected return, their portfolio would be two holdings, one long and one short. If they were to minimize risk, then the portfolio would be all cash. Does that kind of portfolio make sense? I have frequently disagreed with many decisions taken by the Federal Reserve, but the idea of either abolishing the Fed or to move it to a single mandate sounds ludicrous to me. Further to my post last week detailing signs of global healing, I have had a number of discussions with investors about the market outlook based on the events of 2008-2009. If we are indeed in a period of global healing, then can we expect the kinds of returns from stocks that we saw coming off the March 2009 bottom? The answer is a qualified no. Consider this chart of US equities spanning the periods in question. In 2008, the market crashed in the wake of the uncontrolled collapse of Bear Stearns and Lehman Brothers. In 2011, the European authorities manage to stem the panic. Both episodes are marked in the red boxes below. In late March 2009, the Asset Inflation Deflation Trend Model moved from a deflation reading, indicating maximum defensiveness, to neutral. The same thing happened about two weeks ago. Here's the difference. In 2009, the market crashed. In 2011, the market didn't. Moreover, many professional investors were positioned for a crash but their performance was hurt by the confusion over the political and economics of the eurozone crisis. As a result, hedge funds and the average long-only manager had a terrible 2011. I would like to discuss the outlook for return and risk for risky assets such as equities. First, because the market didn't collapse in 2011 as it did in 2008, it would be foolhardy to ascribe near triple digit returns for equities going forward. If there are no accidents, such as a US recession, or a Chinese hard landing, investors should enjoy either high single digit or low double digit returns from a diversified stock portfolio. What has changed in 2012 is the map of risk. The actions of the ECB, Federal Reserve and other global central banks have effectively minimized tail risk for investors. Instead of having to worry about a market with a bimodal distribution, which Pimco manager Vineer Bhansali wrote about here, and is shown in the graph on the right below, I believe that stocks and other risky assets have returned to the classic unimodal bell-shaped return distribution shown in the graph on the left. In other words, instead of worrying about catastrophic events, such as a Creditanstalt-like collapse, we just go back to worrying about earnings, recessions, growth, interest rates, etc. Bimodal distributions are much more difficult for professional managers to deal with because there is a single decision or event that can lead the market in two different directions. Will X default? Will the FDA decision be favorable for the company? How will the court rule in this key case that affects the survival of the company? It was largely these circumstances that led to the poor hedge fund and professional manager performance in 2011. Unimodal return distributions, on the other hand, are far more manageable and much easier for professional investors to deal with. Modern portfolio theory is based on bell-shaped return distribution functions. Managers are well trained to manage risk in such situations and virtually everyone does it well. 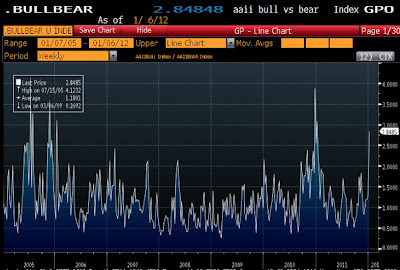 While I believe that equities are poised for reasonable returns in 2012, there are significant risks to the market. In the short term, I agree with Cullen Roche at Pragmatic Capitalism when he pointed out that investors appear to be overly complacent and due for a corrective pullback, a conclusion also shared by Mark Hulbert. 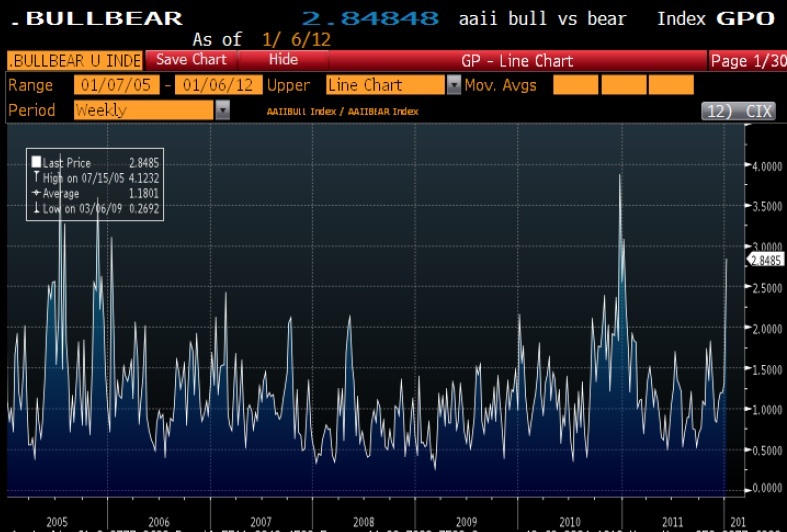 In the medium term, believe that there are two major macro risks that face the market in 2012. 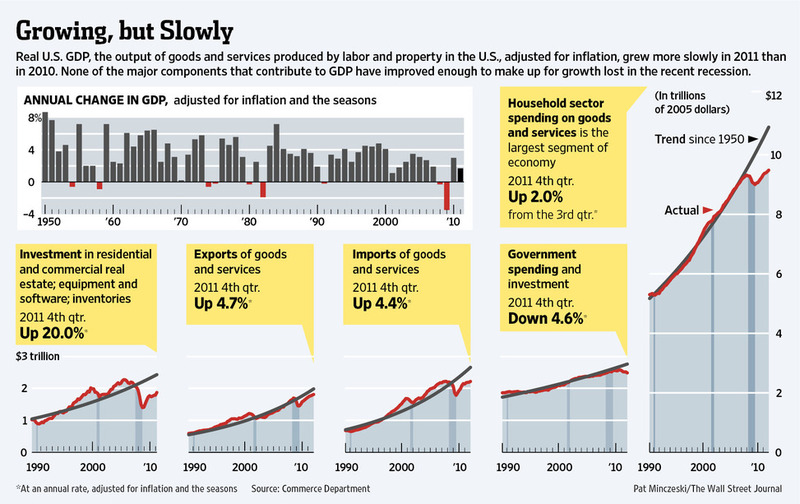 First, there is the risk of a recession in the US, which has loudly trumpeted by ECRI. While the high frequency economic releases have generally been coming in above expectations, which points to a weak but non-recessionary economy, what bothers me is that respected investors who are not permabears, such as Jeremy Grantham and Jeffrey Grundlach, have been cautious. If the American economy were to move into recession as per ECRI, then we should be seeing its effects now. I would be watching carefully corporate guidance and the body language of management as we go through Earnings Season. Last week, earnings were generally upbeat with the exception of GOOG. The second major macro risk facing the market is a hard landing in China. While the Chinese economy is showing signs of slowing, the authorities are also taking steps to cushion the slowdown. Most worrying though, is analysis from Patrick Chovanec that indicates that Chinese GDP growth would have been 6.6% had growth from the property sector been flat - which is a brave assumption given the sad state of the property market today. A Chinese GDP growth rate of 6.6% would likely freak out the markets as it is in hard landing territory. As this letter will suggest, I don't think this is the year you want your portfolio in typical long-only funds. There is a lot of tail risk this year coming from Europe. Banks have to mark to market their Greek paper and Credit Default Swaps get paid out. Banks become insolvent, but small depositors can get their money because of limited deposit guarantees up to X. Insolvent banks either get merged with strong banks (not many in Europe), get taken over by their sovereigns and restructured into good bank/bad bank (i.e. taxpayers take the hit), or go bankrupt. Some investors will get hurt, but there will be no mass panic because of ECB liquidity. The inter bank market would likely freeze up under such a scenario until there is more clarity about which banks live and which die. In the meantime they live on emergency ECB life support. Risk premium migrate to the sovereign bond market. Any crisis will get contained if the ECB prints. The Germans, if they object, will be faced with a choice of a catastrophic failure vs. QE. In the end, I believe that they would choose QE. This sounds more like a Long Term Capital Management crisis whose effects was contained, rather than a Creditanstalt event that takes down the banking system and set into motion the second leg down in the Great Depression. We have a situation now where the P/E ratio, based on the trailing 12 months of earnings, is a mere 13. That may not be a classic trough by any means, but only 20 per cent of the time in the past quarter-century has the multiple been this low. That is something for investors to consider. The multiple based on estimated earnings for the next 12 months – the “forward” P/E – is less trustworthy than the trailing P/E because it depends on analysts’ ability to accurately forecast the coming year. But as it stands, the forward multiple is now just a snick below 12. In the past quarter-century, we saw only one other time when it was this low on a one-year forward basis, and that was the first quarter of 1988. A year later, the S+P 500 rallied 15 per cent. That, too, is something to mull over. For now, my Trend Model is showing a neutral reading and I anticipate some short-term choppiness as the market consolidates and digests the recent gains from the October lows. Beyond the short-term choppiness, equities should show some reasonable returns for the remainder of the year. There has been a lot of hand wringing over the years about the problem of counterfeiting and copyright piracy in China. The Chinese, it is said, have no respect for intellectual property and will copy anything. Many have advocated tough solutions to deal with the piracy problem. Back when I was a private equity professional investing in China, I’d say that 9 out of every 10 opportunities I saw involved what I would call “commodity” manufacturers — factories that churned out a standardized, low value-add product that virtually anyone could make, and competed solely on price. Even though they accounted for a big chunk of China’s productive capacity, and often were making good money, we did everything we could to avoid such investments. We figured that, whether in one year or ten, these companies would inevitably lose their purely cost-based competitive advantage as China’s economy developed. They represented China’s past, not its future. At least one out of every ten Chinese companies we looked at, though, had more promise. Either they were making something unique, or they were doing something markedly better than their competitors: achieving higher quality, reaching more markets, building a brand name, etc. Often their costs were higher. Among other things, they had to hire better, more expensive employees, not just in production, but in sales, marketing, and customer service. They had to invest in training and sometimes even in partnerships with local schools to ensure a steady stream of qualified workers as they expanded. Like any investment, it was a risk, but it had the potential to pay off by setting them apart from the low-cost, low value-add pack. These are the companies we were betting would own the future. Still, as China grows richer, life is growing harder for fakers. A recent study of China’s luxury market by Bain, a consultancy, concludes that “demand for counterfeit products is decreasing fast.” McKinsey, another consultancy, found that the proportion of consumers who said they were willing to buy fake jewellery dropped from 31% in 2008 to 12% last year. This is good news for all brands, not just the blingy ones. “Consumers are looking for the real thing, and they are increasingly willing and able to afford it,” say the authors. Another reason why fakers are under pressure is that Chinese firms now have intellectual property of their own to protect. Brands such as Lenovo (a computer firm) and Haier (a maker of everything from fridges to air-conditioners) are highly valuable and therefore worth defending. The more Chinese innovators gripe about fakery, the more strictly the government enforces the law. It just announced that it aims to stamp out counterfeit software in government offices by the end of this year. The Chinese are on a well trodden path followed by other Asian economies that have migrated up the value chain, such as Japan (those of us old enough still remember the ridicule of the cheap Japanese imports from the 1960's), South Korea, Taiwan, etc. The latest five year plan calls for more balanced growth and high value-added exports. While the jury is out on the first objective, they seem to be fulfilling at least on the second part. This story illustrates the indirect way to fight intellectual piracy as the problem of is going away naturally of its own accord. Yes, Greg, people do respond to incentives. There has been much angst over the latest report of China's quarterly decline in forex reserves, which has been described as "hot money" fleeing China. A more important sign of China's health is how much "unofficial" money from tycoons and wealthy officials have fled. If corrupt officials were to take money out of China , than it would be an important sign of the metaphorical rats leaving a sinking ship. Macau’s success is not built purely on the Chinese love of gambling. It is also fuelled by a stampede of nervous money fleeing the mainland. A look behind the scenes at Macau reveals a lot about Chinese corruption, and also about how scared many Chinese businessfolk are about the political climate back home. Many come to elude China’s strict limits on the amount of yuan people can take out of the country. A government official who has embezzled state funds, for example, may arrange to gamble in Macau through a junket. When he arrives, his chips are waiting for him. When he cashes out, his winnings are paid in Hong Kong dollars, which he can stash in a bank in Hong Kong or take farther afield. Using figures from Macau's Gaming Inspection and Coordination Bureau, I compiled the former Portuguese colony's gaming revenues for the period 2009-2011. The charts show that gaming revenues have been steadily rising over the last three years. However, a look at the rate of change shows that the year-over-year change in gaming revenues have been falling since peaking last summer. My initial conclusion is that using the crude measure of Macau gaming revenues is to remain cautiously optimistic about the prospects of a Chinese soft landing in 2012. While there may be substantial funds leaving the country through Macau, the lack of acceleration in gaming revenues showing that the unofficial (and smart) money is not panicking over the situation in China. I've been pretty bearish in the last few months, but it may be time to change my outlook. Last week, the Asset Inflation-Deflation Trend Model moved from a deflation to a neutral reading. As a confirmation of this trend, my review of the charts show a picture of global healing after the trauma last year of a near banking crisis meltdown in Europe. Is LTRO the Draghi Put? Most notable is the performance of the banks. The relative performance of the Banking Index shows a pattern of a rally through a relative downtrend. The ECB's LTRO program of providing unlimited liquidity for up to three years to eurozone banks has bought the politicians time and created the perception of a Draghi Put for the market. The recent relative performance of the BKX, which is heavily weighted with the large TBTF banks, is reflective of this relief. Similarly, the performance of the Euro STOXX Index shows a pattern of global healing. Despite all of the financial stress evident in the eurozone, this index formed a wedge and the wedge resolved itself to the upside. In addition, we have been seeing positive European price action in the face of bad news, which is bullish. I wrote last week that European banks have been testing a key support but that level has been holding up, despite all of the bad news in the last few months. Italian 10-year bond yields, which is a key measure of investor confidence, has stayed below the important 7% level in the face of the downgrades. 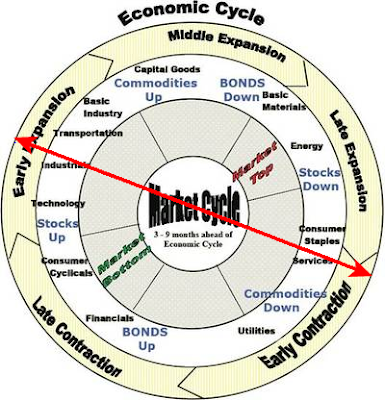 Sectorally, I am seeing signs that the market expects a cyclical rebound, at least in the US. The chart below shows the relative performance of the Morgan Stanley Cyclical Index against the market, which has been rallying and is now in the process of testing a relative resistance level. The Industrials are also showing a similar pattern of relative strength as the sector began a relative uptrend in October. ...while defensive sectors such as Utilities have lagged the market and is now in the process of testing a relative support level. 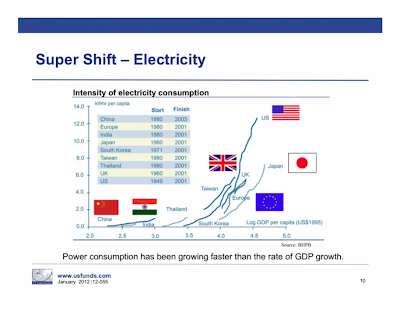 Commodity prices are also showing signs of global healing. The chart below of the CRB Index shows that commodities have rallied through a minor downtrend and it tested the longer term major downtrend, which remains intact. The commodity heavy Canadian market is also showing a similar pattern of rallying through a short-term downtrend, though the longer term major downtrend remains intact. To be sure, it's not up, up and away here for stocks and numerous risks remain. Greece is edging closer to a default as talks with creditors appeared to have broken down. The situation in Hungary remains volatile and has the potential to take down the Austrian banking system. Just because there is a Draghi Put in the market doesn't mean that investors are immune from losses, but I would encourage investors to think of the Draghi Put as an insurance policy with a deductible where you have to incur the first X% in losses. In addition, China isn't out of the woods. 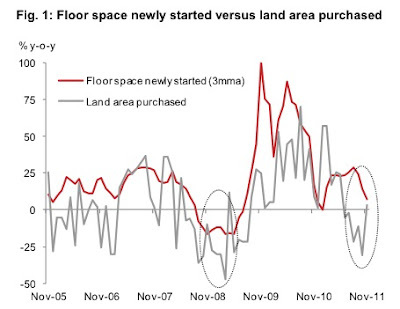 While the Chinese leadership is making noises about stimulus, the property bubble in China is deflating in a dangerous way and it is unclear whether the authorities can achieve a soft landing. The Shanghai Composite has been rallying in line with global equity markets but the index remains in a downtrend. The one silver lining for the bulls is that there appears to be a turn-of-year effect in Chinese equities. The current rally is consistent with the pattern of market updrafts seen starting at about the time of past Lunar New Years. Putting it all together, what does this all mean? My inner trader tells me that in the short-term, the rally looks overdone. Over the next few weeks, continue the strategy of buying weakness and fading strength. Indeed, Macro Story confirms a high risk level for equities by pointing out that AAII sentiment is at a bullish extreme, which is contrarian bearish. Longer term, my inner investor tells me to expect a period of sideways consolidation, likely followed by a bull phase in equities with an expected return of 5-15% in 2012 - assuming that there are no accidents. Which Merrill sentiment indicator to believe? Which sentiment indicator should we believe? It's hard to be a contrarian investor when two sentiment indicators tell completely different stories. The ECB’s balance sheet quietly reached a record size of €2.7tn in late December, with a growth of over 40% in the past six months. Both the size and pace of the balance-sheet expansion have attracted the market’s attention since the start of 2012. Questions have been raised as to whether such an expansion should be regarded as quantitative easing or not. We highlight below that the ECB’s bond purchase program was not the major driver of the expansion but that, instead, increased bank borrowings played a more important role. Also, we note that unlike the Fed, the ECB does not have full control over the size of its balance sheet. The latter could continue to grow in the coming months but it could also shrink on lower reserve requirements and improved funding conditions. [W]e said the ECB’s decision in September to accept unlisted bank bonds — i.e., bonds that the banks could have issued purely to themselves solely in order to pledge them as collateral for central bank funding — was “potentially very significant”. Is this an exclusive party, by invitation only? It's obvious by now that the ECB is throwing a liquidity party. What's more significant, like the Sherlock Holmes story about the dog that didn't bark, is that we haven't heard a thing from the Germans despite the rapid expansion of the ECB balance sheet and tsunami of liquidity unleashed on the market. The effect of this liquidity pump has been to support European banking system. A look at the Euro STOXX 600 Banking Index shows that, despite Unicredit's well-known troubles with its share price, the index is testing a critical support level. Are European banks a screaming buy at these levels? The extraordinary intervention of the ECB has taken the risk of a catastrophic banking failure off the table. Why aren't there more institutions at the ECB's party? The last LTRO auction saw 523 banks at the ECB's party. In the wake of the Lehman Crisis, the Fed's liquidity dump saw everybody and his brother turn themselves into banks to feed at the Fed and the Treasury's troughs. In today's Europe, why haven't we seen more institutions of financials and near financials, e.g. Allianz, Munich Re, the finance arm of auto companies, brokerage firms such as the European operations of Goldman Sachs, even hedge funds, etc., turn into banks to avail themselves of cheap LTRO money? Is the ECB throwing a highly exclusive party, by invitation only? The answer to question 1 depends on the answer to question 2. One of the hardest questions any portfolio manager has to answer is, "What can go wrong with your strategy?" If he doesn't know, then it's a sign that he hasn't fully thought out all the nuances of his investment approach. Here is one example of how I used to evaluate investment strategies when I worked at and with hedge funds. He had been running a "live" paper portfolio in real time for a little over a year. The backtest looked good as it added an alpha of over 3% in that period. Given my assessment of his risk exposures, I wanted to see whether the outperformance was the result of a favorable factor beta exposure, i.e. the strategy bet on a certain kind of exposure and it worked, or the alpha was relatively independent of factor beta. I averaged the weekly alpha of the strategy under different scenarios. On the first line, I asked, "What is the average weekly alpha when the US long bond price is up, down or relatively flat?" In that case, the strategy underperformed when the long bond rallied, largely because it was selling call options at the long end of the yield curve and the premiums weren't enough to offset the gains in bond prices, and outperformed when the long bond price was either flat or falling. Similarly, I performed other forms of scenario analysis. What happens to the alpha when the Canada and US curve diverge? What happens when implied stock volatility (I didn't have a good proxy for bond volatility) moved up or down? I used scenario analysis to project an annual alpha. The average case analysis assumes a Gaussian distribution where 50% of the time exposure to that factor beta is neutral, 25% of the time it is favorable and 25% of the time unfavorable. Using the example of the long bond price factor, I calculated an expected alpha assuming that 25% of the time, the bond price was falling, 25% of the time it was rising and 50% it was neutral. In this case, that came to an expected alpha of 3.90% per annum. I wanted to stress test the strategy some more. What if the market gods aren't with us? In the second column labelled "Adverse Case", I assigned weights of 50% neutral, 33% unfavorable and 16% favorable. Using the example of the long bond price factor, the expected alpha came to 0.80% per annum. What happens if a catastrophic scenario? In the third column labelled "Worst Case", I assigned weights of 2/3 neutral, 1/3 unfavorable and 0 favorable. (Remember that these are weekly alphas and it would be difficult to believe that, in the case of the long bond price, it would fall for a single week in an entire year and would be rallying 17 weeks out of 52 weeks in the year.) The expected alpha in the worst case analysis for the long bond price factor came to -2.13%. Putting it all together, the strategy looked pretty good. We could expect an alpha in the order of 3.0-3.6% a year - which is an astounding figure for a bond portfolio. In a typical bad year, we could still expect outperformance of 0.8% to 1.8%. If the roof caved in and everything went wrong, alpha deteriorated to between -2.1% and a positive 0.2%. This is an example of a simple method of evaluating any investment strategy using scenario analysis with factor betas. This is another way of asking the question, "What can go wrong with the investment strategy and how badly could things fall apart?" Ultimately, we passed on implementing the strategy not for investment reasons, but for business ones. If anyone is interested in further details or in funding such a bond strategy, please contact me at cam at hbhinvestments dot com and I will be happy to refer you to the bond manager. Will good news be good or bad news? In the wake of the "beat" by the ADP release and as traders wait for the Non-Farm Payroll figures due out at 830 Eastern Time, here is something to ponder. 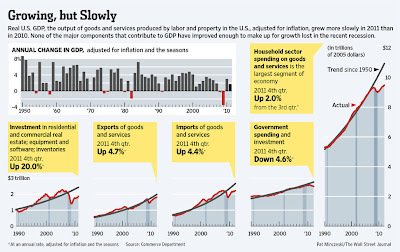 Is good news (better growth) good news or bad news? The primary dealers also see a 60% chance of the Fed adding to its System Open Market Account holdings — embarking on QE3, in other words — in the next two years. That also gibes generally with what many on Wall Street seem to expect. Analyzing historically the reaction function of real rates to QE announcements, we find that USD19bn of new QE tend to reduce real rates by 1bp. Based on this estimate and on the model dislocation, we find that the 10Y real yield was fully pricing in Operation Twist in September and that since then the dislocation has increased to price in another full QE package, similar in size to QE2, of about USD800bn (excluding reinvestments of maturing agency and MBS holdings). How will stocks react? Positively because organic growth is rising, or negatively because the Fed won't be unleashing a tsunami of liquidity that accompanies quantitative easing? Are the markets already to price in such a scenario? Ed Yardeni wrote that while the Street consensus revenue estimates have been ticking up, earnings estimates have been falling. This sounds like an environment of good news is bad news for the markets and bad news is good news. The starkly contrasting economic trajectories of countries inside the eurozone were highlighted on Tuesday as Germany reported unemployment at 20-year lows while Spanish jobless figures rose for the fifth consecutive month. Moreover, there is an interactive graphic in the article showing the different unemployment rates by country. While the latest eurozone seasonally adjustment unemployment rate is 10.3%, compared to 10.1% a year ago, there are vast gaps in unemployment rates between member states. Most notable are Germany at 5.5% (vs. 6.8% a year ago), the Netherlands at 4.8% (vs. 4.4%) and Austria at 4.1% (vs. 4.2%). The underperforming PIIGS are suffering vastly higher unemployment, with Greece at 18.3% (vs. 13.9%), Ireland at 14.3% (vs. 14.2%), Portugal 12.9% (vs. 12.3%), Spain at an astounding 22.8% (vs. 20.5%) and Italy an outperformer at 8.5% (vs. 8.4%). As a point of reference, the unemployment in France, which is the other major partner in the eurozone leadership, stands at 9.8% (vs. 9.7%). How badly will austerity bite? Please note that these unemployment figures are dated October 2011, before the full brunt of many announced austerity programs have been felt. As the effects of these cutbacks start to wind their way through these economies, will unemployment go up or down? How long before the elites are faced with a political backlash? Greece was promised a second emergency bailout worth €130bn (£108bn) in October after it became clear that the first rescue package, agreed in May 2010, was not enough to stabilise its debts. But talks about this second deal, including a writedown for Greece's private-sector lenders, are still continuing. Kapsis told Greek television: "This famous loan agreement must be signed, otherwise we are outside the markets, out of the euro and things will become much worse." Reports have emerged since the weekend that the troika could demand fresh austerity measures from Athens in exchange for a new loan to ensure that it meets its targets for reducing the deficit. But Kapsis also said imposing more cuts on a recession-hit nation could be very difficult. The Greek government has stepped up the pressure on its eurozone paymasters by warning that unless a new bailout for the recession-hit country is agreed within the next three months it will be forced out of the single currency. No doubt much of this rhetoric is typical of the posturing that goes on in negotiations, but as austerity programs begin to bite all over Europe, investors will start to worry about and price in the tail-risk of social upheaval and political instability. The ECB's LTRO program of unlimited liquidity has bought the politicians some time. Don't be too surprised if that window of time may be shorter than expected. I recently wrote that 2011 was a choppy market where it was very difficult for institutional investors to beat the market and for hedge funds to make any money because of the tendency of the market to whipsaw. In that case, my inner trader has observed that there is potential for nimble traders to profit from trading the swings of a range-bound market by buying the dips and selling the rallies. The chart below shows the relative performance of SPY, which represents US stocks and the risk-on trade, against TLT, which represents long Treasury bonds and the risk-off trade. I have overlaid on top a short horizoned RSI indicator of 7 days. Note how it has been profitable to sell stocks and buy bonds when RSI approaches the 60-65 level and buy stocks and sell bonds RSI goes below 30. Where are we now? With the opening day rally yesterday, the SPY/TLT 7-day RSI stands at 55, which is very near the sell zone for stocks, indicating that the upside is limited - unless you believe that stocks are on the verge of a major upside move. My short term liquidity measures is also telling my inner trader to sell this rally. Measures of MZM growth are flattening out, which is generally not conducive to a sustainable equity rally, after an uptrend that largely coincided with QE2 earlier last year. This chart of the growth of broader monetary aggregates also tell the same story. 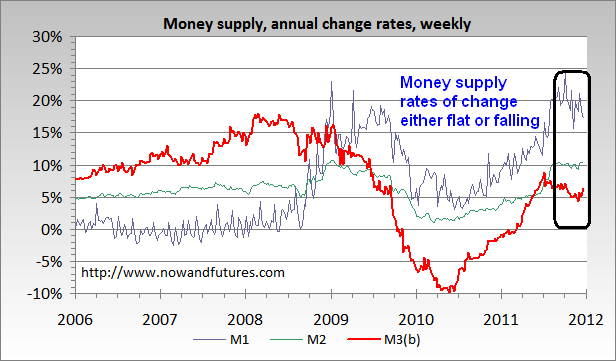 Money supply growth is now either flattening out or decelerating after a period of acceleration that began in mid-2010. Everything else being equal, an environment of slowing money supply growth usually provide headwinds to further advances in equity prices. My inner traders is telling me that the upside in stocks is limited at these levels and to fade this rally, but to be prepared to buy the dips. 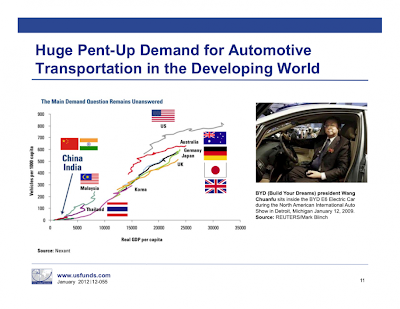 How it's likely to change (see Back to fundamentals in 2012). I urge all investors to have a game plan for the year ahead and beyond. Despite all of our best efforts, our forecasts can and will fail and how you react to the change in direction is more important than the decision you take today. Following the twin market implosions of the past decade—first tech, then real estate—many retail financial advisors are looking for more tactical, meaning active, asset allocation solutions for client portfolios to dampen volatility, improve total returns and avoid market catastrophes. At least some of them fear that if they don’t dramatically change the way they allocate client portfolios, moving away from traditional buy-and-hold investing strategies, they could lose clients. So say a handful of advisors and an investing expert. Things could get especially bad if another bear market hits, says Ron Carson, founder and CEO of Carson Wealth Management Group. “[Investors] are hanging on by a thread right now, and I don’t think they’re going to forgive.” A Natixis Investor Insights Study found that 63 percent of investors are now paying more attention to risk than ever before. If the market nose-dives, advisors are going to want to have a different story to tell. They can’t just tell clients to hang on and wait it out like many of them did in 2008. According to a survey by Cerulli Associates, the number of FAs using either a pure tactical allocation or strategic allocation with a tactical overlay is now at 61 percent, up 8.3 percent from 2010. A Jefferson National survey from September 2011 found that 75.5 percent of advisors believe that active portfolio managers can outperform an index over the long term. In Jefferson National’s 2010 survey, 66 percent of advisors said clients were more confident with a tactical asset management strategy, while only 34 percent said clients were more confident with a traditional buy-and-hold strategy. Are you betting the farm? Stocks didn't go anywhere in 2011. In fact, they haven't gone anywhere since the NASDAQ peak in 2000. In the current low-return environment, advisors find that clients are less forgiving of draw-downs in their portfolio. In days past, the practice of overweight a portfolio with a manager to make a big style or macro bet that "looks through the economic cycle", e.g. a value manager, was perfectly acceptable. The downside to managers that make such style bets is they tend to badly underperform during certain periods when their style is out of favor - and investors are far less tolerant of such draw-downs in the current volatile and low return environment. As an example, there were numerous managers who were wary of internet stocks during the Tech Bubble runup. I had watched many good managers and strategists go down in flames because they were one or two years early because their investors couldn't stand the underperformance. Today, investors are highly intolerant of negative volatility, largely because of the low return environment that we have been stuck in for the last decade. The message is clear. Take control of your portfolio. Be aware of the investment environment. Your investment philosophy and objectives are up to you. However, you should make sure that you have engineered your portfolio's risk profile sufficiently so you survive to get to your objective.